When I saw the preview video for episode five of Real World Brooklyn, with clips of Ryan Conklin shouting and him being noticeably saddened in relation to his experience in Iraq and his being in New York for the anniversary of 9/11, I felt dread about what the episode would show. 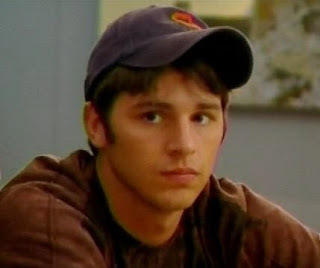 I had started to feel fondness for Ryan the character during the first episode and by the end of the fourth I definitely had affection for the person. So being empathetic towards him, I was eager to find out what happened and concerned about what that may be. The episode begins like the relaxing ascension on the first hill of a major roller coaster. You can lean back and enjoy the view on a nice summer day. In early September, the roommates prepared to go the Love Brigade fashion show during the Mercedes-Benz Fashion Week for Spring 2009 in NYC. Ryan lightheartedly feigned interest in fashion with Baya Voce. It's funny, you have to know enough to know what to say in order to mock it and Ryan did it well. Next, Ryan the scamp was shown mischievously tying people's shoelaces backwards as a playful prank. The affected roommates were mildly amused. In the same spirit, JD Ordonez also wanted to play and to give Ryan and Chet Cannon a silly prank in return. With Scott Herman and Katelynn Cusanelli's help, he sprayed some shaving cream into Chet and Ryan's room while they were sleeping. The boys were awakened by the rain of this light foam. By the way, we are now at the top of the hill on that roller coaster. Hang on. Ryan immediately knew that JD was responsible (because of JD's distinctive laugh) and confronted him. Ryan began shouting at JD in a frightening rage with an out-of-control volume and demeanor that made Ryan appear to be almost completely unhinged. JD, though lying down, stood his ground and didn't let himself get intimidated, which probably fueled Ryan even more. The other roommates cowered in their rooms, fearful of the shocking outburst that they could hear. Eventually Ryan broke off the attack and returned to his room with Chet to wipe up the residue of the shaving cream. 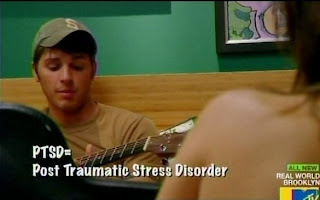 Ryan tried to explain on his MTV blog that though he was indeed agitated by what JD had done, he intentionally wanted to look furious about being blamed for the shoelaces so that people would think he really hadn't been doing it. 2) The reaction itself. I believe that Ryan intended to put on a good show when confronting JD, but real rage did take over. Devyn made a good assessment that Ryan's reaction came from something much more serious that being coated with foam. To me, Ryan's being awakened did trigger something in his mind. He was unwillingly reminded that he could have some kind of negative experience back in civilian life from just being awakened and for this, at least for awhile, he hated JD for causing it to occur. 3) The planned retaliation. Seething with anger over the feelings that JD's prank had produced in him, Ryan told Chet that he would like to duct tape JD's mouth with a sock in it and tie JD to a mattress and put him outside. Later, Ryan lost sleep trying to formulate a counter-attack that would include a fish and JD slipping and potentially hurting himself. I like to believe that Ryan wouldn't actually torture or cause someone physical harm, so giving him the benefit of the doubt, these statements must just be a way of venting through imagination. Still, they reflect that something must be terribly wrong to have such ill-will over an incident so inconsequential as shaving cream. That brings us to the subject of post-traumatic stress disorder (PTSD). It is understood that the show is edited to create whatever impression is desired, but it still seems clear that something is affecting Ryan. What is really disconcerting is that Ryan keeps saying that he knows people who are badly affected by keeping their problems bottled up and by not wanting to be thought of as having a problem. As many times, Ryan also says that he, Ryan, is also like that (hint, hint). If this is not being done consciously, then certainly his subconscious is shouting to everyone that something is not right. There should be compulsory evaluation over time for stress disorders of veterans returning from combat so that pride doesn't get in the the way of getting some kind of relief. On the 7th anniversary of 9/11, Ryan went with a army friend to the commemoration at Ground Zero. He was moved by that and by further reflections on the day and the effects the original tragedy has had on the world and on him personally. Ryan has a hard exterior but some inner sentimentality. No shame in letting a softer side show through; he should do it more. The episode ended with Ryan Conklin looking at the light display for the twin towers and dejectedly commenting on his "crummy life". This is where the prayers of his new TV friends cause Clarence, now AS1, to be summoned and to point out to him the wonderful life before and yet to be.